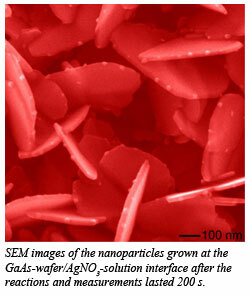 For the first time scientists have been able to watch nanoparticles grow from the earliest stages of their formation. The breakthrough was made possible by high-brightness and high-energy synchrotron radiation techniques developed in part by HPSynC. The work should lead to new ways to control nanocrystal growth, a result that will affect applications ranging from making new energy materials such as solar cells to chemical and biological sensors important for national security. The scientists used high-energy x-rays from the APS to carry out diffraction studies that enabled them to gain information on the crystal structure of the materials. The high brilliance and high penetration of this x-ray source allowed the researchers to watch the crystals grow from the beginning of their lives. The atoms scatter very short wavelength x-rays and the resulting diffraction pattern reveals the structure of these unusual particles. Quite often the chemical reaction occurs in a very short time and then evolves. The scientists used highly focused high-energy x-rays and a fast area detector to make this investigation possible. This is the first time-resolved study of the evolution of nanoparticles from the time they are born. This study shows the promise of new techniques for probing crystal growth in real time. The ultimate goal is to use these new methods to track chemical reactions as they occur under a variety of conditions, including variable pressures and temperatures, and to use that knowledge to design and make new materials for energy applications [Y. 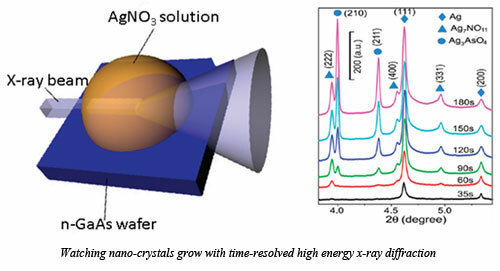 Sun, et al., NANO Lett., 10, 3747 (2010)].